CANbus networks are increasingly used in the maritime market, offering easier operation and greater comfort for end users. 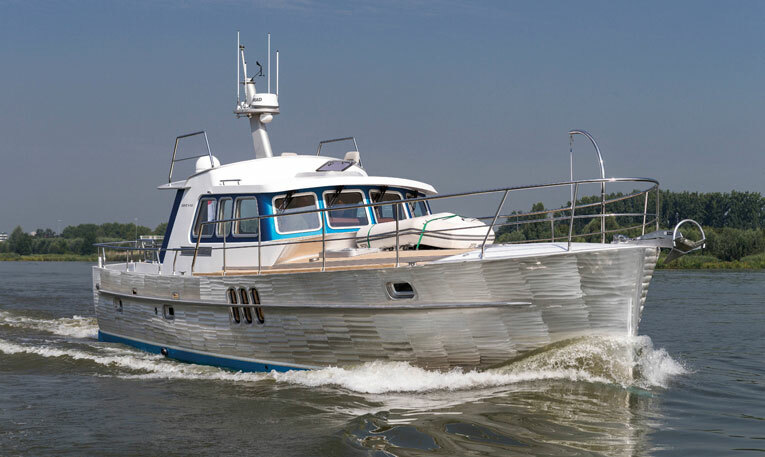 The Korvet 14 CLR from Deep Water Yachts was specifically equipped with the intelligent Mastervolt CANbus technology (both MasterBus and CZone), allowing important data such as the contents of the water tanks and charge status of the service batteries to be monitored at a glance and the associated alarms to be set for every level. The system is also equipped with a GPRS Module for communication via mobile phone (such as text messaging when a battery is running low). Thanks to the integration with leading navigation partners, it is also possible to monitor and control from the navigation displays. By combining the various activities in one mode, the system can be adjusted to the desired setting in one easy action; for example ‘mode off’ if you do not plan to use your yacht for a longer time period. This command switches off all loads, including the inverter element of the Mass Combi Ultra, and automatically brings the electric battery switches to the right position. It is also possible to configure the deck lighting so it is dimmed when you leave your yacht. It is now much easier to set the yacht to ‘night sailing’ or ‘relax’ mode. Moreover, Mastervolt digital switching also gives full control over your yacht with only a few switches. 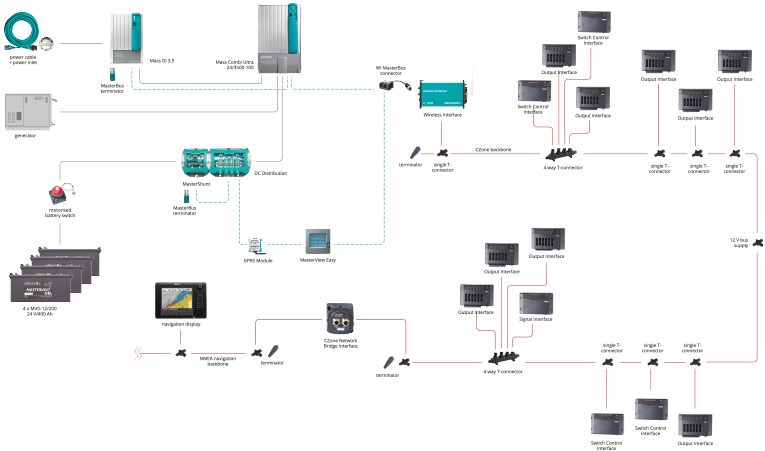 Navigating, monitoring system data and the control of power electronics via a single display. Digital switching and monitoring of relevant system data via iPad. A battery charger, inverter and AC transfer system are combined in one casing to save space. The maximum shore power per port may vary between 4 A to 16 A. A simple and automatic control via the power electronics required to ensure the shore fuses do not blow when more power is consumed. Availability of relevant system data via mobile phone. 24 V battery capacity for larger loads. The Mass Combi Ultra is a 100 A battery charger, 3500 W inverter and AC transfer system in one. The Combi can be used for all energy sources such as the generator, shore power, batteries and solar panels. It automatically controls and distributes power, seamlessly passing on the available sources. As a result, batteries are always sufficiently charged and there is a stable AC voltage for the use of electrical equipment onboard. This all-in-one solution provides optimal ease of installation and comfort. This system comprises four series/parallel switched 12 V 200 Ah batteries that create a 24 V battery voltage. The AC and DC loads require a total of 5.9 kWh. 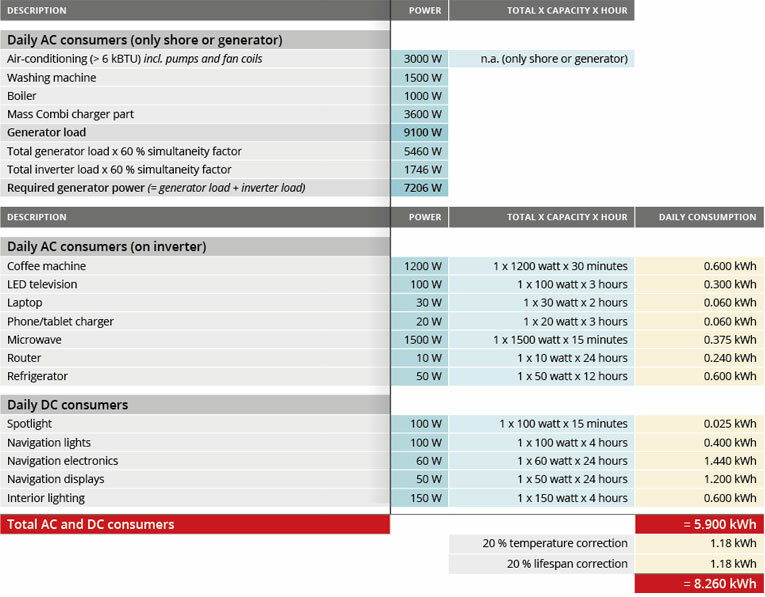 Multiplied by a temperature correction of 20 % and a lifespan correction of 20 %, this results in a total consumption of 8.26 kWh, divided by 24 V = 344 Ah. This means that a battery capacity of 400 Ah is required. The service battery in this system functions cyclically (regular 50 % charge/discharge) and therefore uses gel technology. Gel batteries are completely maintenance-free and ideal for cyclic applications such as service batteries. 1 x Mass GI 3.5kVA/16A; lightweight isolation transformer for safely using shore power, vital for steel or aluminium vessels to avoid electrolysis and corrosion. 1 x motorised battery switch. 1 x MasterShunt 500; MasterBus integrated battery monitor, with detailed information on the status of your batteries. 1 x DC Distribution 500; connects up to four DC devices to the DC groups. 4 x Switch Control Interfaces. 1 x CZone Network Bridge Interface; for isolating sections of a NMEA 2000 network to decrease standby current draw. 1 x NMEA 2000 power cable. 1 x power cable 16 A, 25 mtr.